Current research on sustainable regions includes a study on the outcomes of the US Department of Housing and Urban Development's Sustainable Communities Initiative (SCI). For this study, planners in 74 regions around the country were surveyed on their experiences with SCI, which led to the creation of case studies on collaboration in the federal government and in SCI grantee regions to serve as examples and models. Ongoing research includes case studies on the work of cities, suburbs, regional government, and cross-sector collaborators on implementing regional sustainability plans. 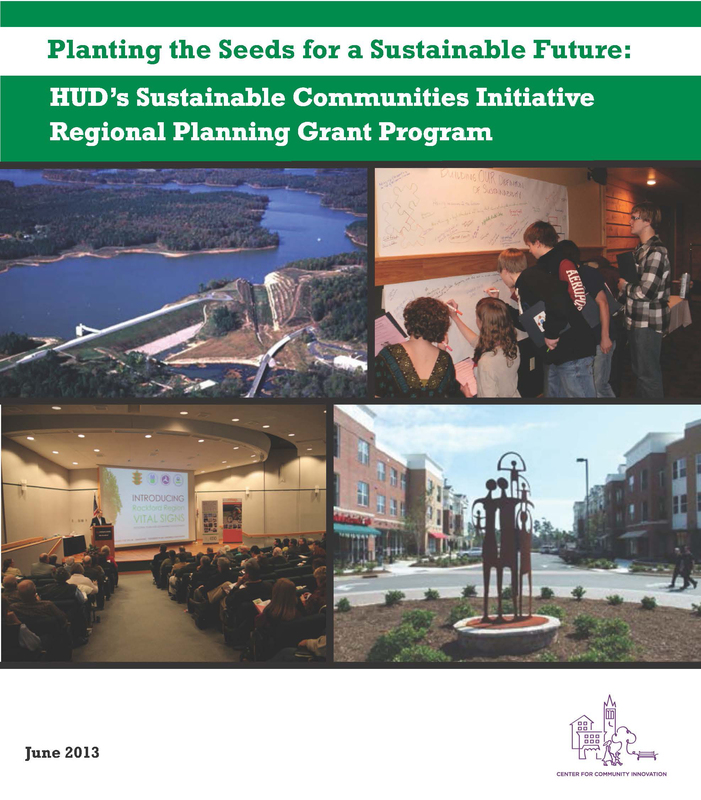 This article explores the planning process dynamics and outcomes of the U.S. Department of Housing and Urban Development’s (HUD’s) Sustainable Communities Initiative (SCI) in three metropolitan regions: the San Francisco Bay Area, the Puget Sound region in Washington State, and the Minneapolis-Saint Paul, Minnesota (Twin Cities) region. Approved by Congress in 2010 and renewed in 2011 for $250 million in appropriated funding, SCI was a grant program formed out of the Partnership for Sustainable Communities, an interagency collaboration among HUD, the U.S. Department of Transportation, and the U.S. Environmental Protection Agency. In this article, we assess the impact of the SCI grants on planning processes, specifically, the extent to which SCI fostered greater collaboration and shared definitions of equity. Through indepth interviews with more than 50 SCI participants across the three regions, this study finds that the grants had both short- and long-term impacts in (1) breaking down barriers to coordination and collaboration across jurisdictions and planning sectors, (2) promoting a greater attention to and understanding of issues of social equity, and (3) institutionalizing equitable planning practices. The impacts were uneven across regions, however; the project in the Twin Cities was by far the most effective. The findings of this research have implications for HUD and other agencies as they select grantees with which to collaborate in the future. The Sustainable Communities Initiative Regional Planning Grant (SCI-RPG), a competitive grant, supported collaborations among diverse players in metropolitan regions to plan for livability, awarding $165 million to 74 metropolitan regions. This report presents findings about the program based on a survey of grantees. Overall, impacts of the grant program included new relationships, better community engagement strategies, new datasets and tools, regional plans that incorporate the three Es (environment, equity, and economy), and new projects jumpstarted. But the most significant impact of the program was in spurring new partnerships across sectors. Most relationships have carried on beyond the grant period, whether they are now focused on implementation or other planning efforts. Many regions expanded their awareness of regional equity issues as a result of the grant, specifically by adopting new metrics to track distributive issues and reaching out to under-served populations. However, some regions failed to engage municipalities in their efforts, and funding for implementation is scarce. Still, this survey shows that most grantees agree that the SCI-RPG program was a unique and successful experiment in using federal assistance to power collaboration and equity for regional sustainability planning. Regions across the United States have developed sustainability plans and programs funded through the U.S. Department of Housing and Urban Development’s Sustainable Communities Initiative (SCI). In California, this grant overlapped with a state mandate for regional sustainability planning, SB 375, legislation charging regions with developing long-range sustainability plans to reduce greenhouse gas emissions. Regional agencies lead sustainability planning efforts, yet little is known about how effective and equitable regions are in their engagement with sustainability planning. We examined how three federally funded SCI projects in California incorporate social equity and explore the process and outcomes. We focus on the conditions under which regional collaboration is most conducive to incorporating equity. We found that equity approaches vary greatly by region and are as much about process as product. Networks of information sharing, trust and relationships in regions awarded SCI grants have increased. However, regional sustainability planning processes are not without conflict as participants maneuver though historic institutional challenges. Although regional planning has gone in and out of fashion over the last 100 years or so, recent years have seen a nationwide resurgence of interest and activity, due in part to the Department of Housing and Urban Development (HUD) Sustainable Communities Initiative Regional Planning Grant (SCI-RPG) program. Funded by Congress in 2010 and 2011, the SCI-RPG awarded grants on a competitive basis for collaborative regional planning efforts supporting more sustainable development patterns.Its $165 million awarded to 74 grantees from across the country marks the largest federal government investment in regional planning in the US ever. That effect was magnified many-fold given that there were 354 applications from 289 different regions, which has spurred conversations about regional sustainability across the country to a level never before seen. This report examines how those conversations about sustainability are taking shape in different regions of the country, the different approaches they use to build collaborations, and what distinguishes the regions that submitted winning SCI-RPG grant applications from the rest. Despite considerable confusion about how to achieve sustainability (or even how it is defined), regions from throughout the country reveal in their applications deep interest in learning how to grow more efficiently while preserving the environment and enhancing opportunity. This report examines the effectiveness of the Department of Housing and Urban Development (HUD) Sustainable Communities Initiative (SCI) in expanding participation in US Department of Transportation TIGER (Transportation Investment Generating Economic Recovery) grants among regions with broad economic disparities along racial and ethnic lines. The measure used was their ability to leverage TIGER funding to: 1) expand the use of regional-level planning informed by equity considerations, and 2) increase funding in disinvested communities. 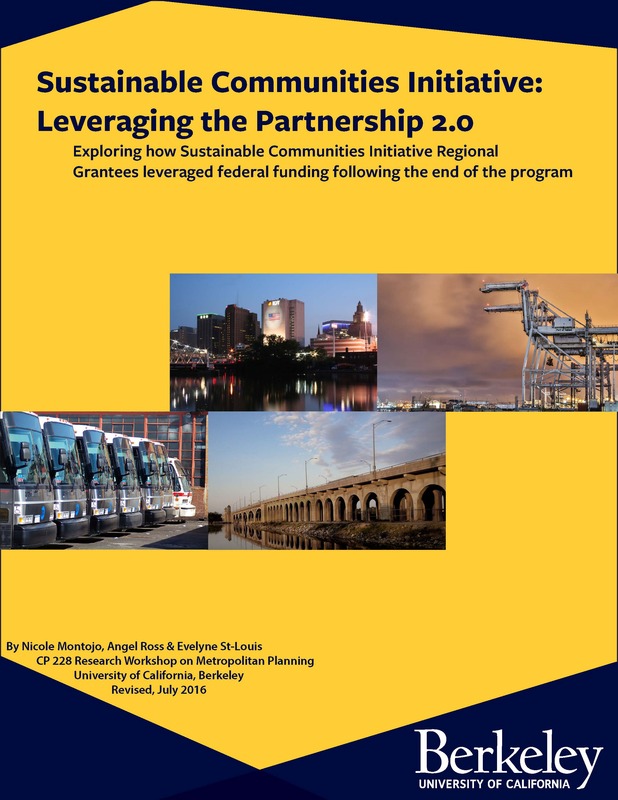 This is important to investigate because, while unique in leveraging federal dollars for equity-informed regional planning efforts, the SCI did not offer specific strategies for implementing them and leveraging them for additional investment. Key considerations are the wide disparities among the 74 regions taking part in the Initiative: not only in their socio-economic and racial-ethnic compositions, but also in the per-capita amounts of philanthropic funding. The regions as a whole grew in their ability to successfully navigate the TIGER grant process and direct TIGER dollars to low-income communities of color. Although this is partly explained by internal changes within DOT, this shift seems to have occurred more so in the 74 SCI regions than those outside it. We also found an apparent stratification of regional capacities as evidenced by disparities in ability to apply for and win TIGER grants. Thirty of the 74 SCI regions failed to win TIGER grants; another 14 did not apply. This stratification is exacerbated by a “planning gap” – a lack of additional funding to support planning beyond the SCI grant. Looking forward, what steps could help close these inter-regional gaps in capacity and planning? From the federal perspective, the US DOT could further encourage the Sustainable Communities planning processes by putting less emphasis on shovel-ready projects in its scoring criteria for TIGER grants. From the private sector side, philanthropies with the flexibility to do so could target regions in need of increased planning capacity. 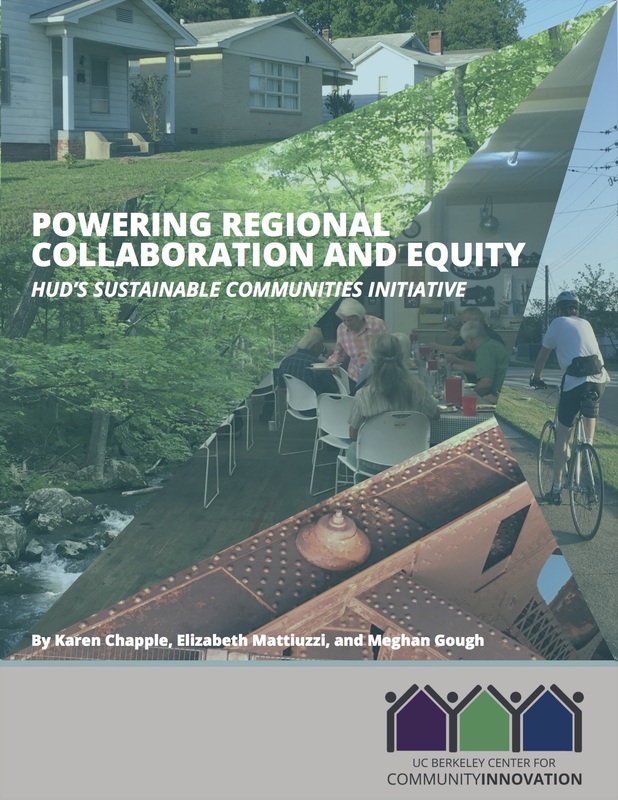 This report examines the effectiveness of Regional Planning Grants awarded to three regions under HUD’s Sustainable Community Initiative -- specifically their contribution to encouraging region-wide cooperation and eliminating barriers to collaboration created by institutional, jurisdictional, and professional practices. Notable achievements were: engaging suburban and urban stakeholders in simultaneous processes; disrupting power dynamics to enhance the influence of community participants; and enlisting meaningful participation of business interests. The report also explores the degree to which the grants promoted a greater regional attention to equity and helped institutionalize planning processes that were more deeply informed by equity considerations. Notable successes in these areas include adding staff and agency structures; including a community advisory group dedicated to equity concerns; development of a shared definition of equity; and a commitment to specify equity components as part of the regional planning matrix. The findings highlight the importance of providing equity advocates with the tools they need to meaningfully influence decision-making processes while also ensuring that regions have a strong post-grant plan in place to continue the work. Challenges remain to achieving effective collaboration over the long-term and ensuring outcomes that incorporate equity considerations, given the inherent tensions among the needs of urban, suburban, and rural communities, as well as varying capacities to supply energy and time to remain engaged. It is also apparent that the durability of any progress toward collaboration and equity during the grant is affected by a region’s particular social-political context and access to financial support for these types of efforts. It is too soon to tell what long-term impacts this experiment in regional planning might have, but what has been shown so far is promising. 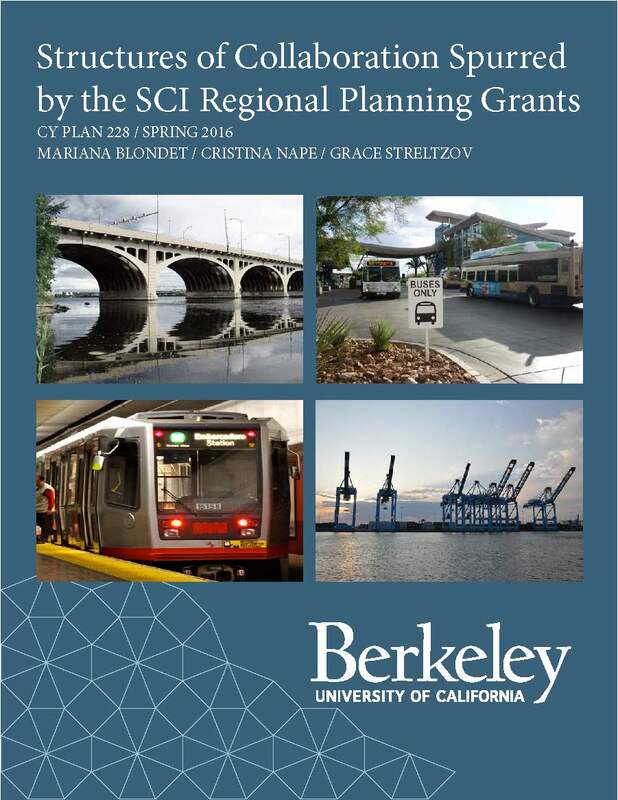 In this video, students from Professor Karen Chapple's spring 2016 graduate studio in City and Regional Planning at UC Berkeley present their findings from three case studies on regions that received SCI regional planning grants. They discuss the lasting impacts of the unique regional planning process in each metropolitan area, comparing the outcomes for planning culture. Specifically, they compare approaches to equity, stakeholder engagement, and relationships between local jurisdictions in those regions. This video includes two student presentations from Professor Karen Chapple's spring 2016 graduate studio class in City and Regional Planning at UC Berkeley. The first presentation, "Structures of Collaboration in the Sustainable Communities Initiative," describes the demographics and consortium structures of different regions that developed regional plans with support from HUD. It examines inequality in regions and the different approaches that consortia took to including marginalized communities in their planning process. The second presentation, "Leveraging the Partnership" (which starts at 24:32), looks at the question of what happened after SCI in terms of regions' ability to secure funding for the implementation of their regional plans. 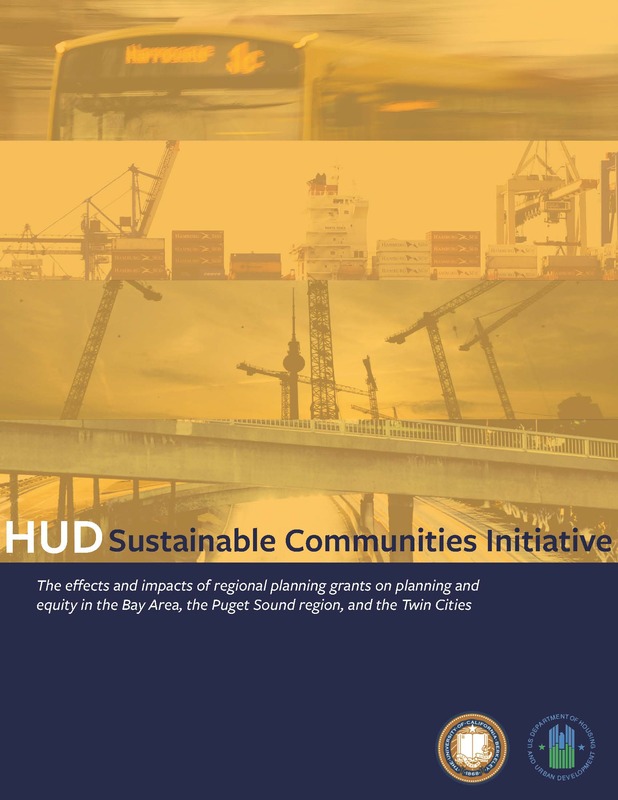 This report examines the impact that regional conditions, particularly income disparities between racial and socio-economic groups, had on the diversity and structure of partnerships formed under the Department of Housing and Urban Development’s Sustainable Communities Initiative (SCI), which is intended to encourage a regional approach to planning challenges that enlists a large and diverse roster of participants. We developed a 12-point governance typology to characterize grantees’ success in meeting these goals, which were shown by a number of elements, including the constituencies who were at the table, the method for sharing grant resources among consortia members, and the steps grantees took to ensure that their governance structures were shaped by diverse perspectives. Where the income disparities were smallest, we observed a “build a table” approach, under which grantees create formal structures to address equity and encourage inclusion, a so-called “epistemic community,” which is characterized by a shared common understanding among a diverse set of stakeholders. This has been found to be more successful in responding to the imperatives of growth and equity (Benner and Pastor 2012). By contrast, in regions where the income disparities among groups were greater, grantees were more likely to take a “seat at the table” approach, by stipulating representational requirements in their governance, without spelling out formal structures for incorporating equity and diversity.